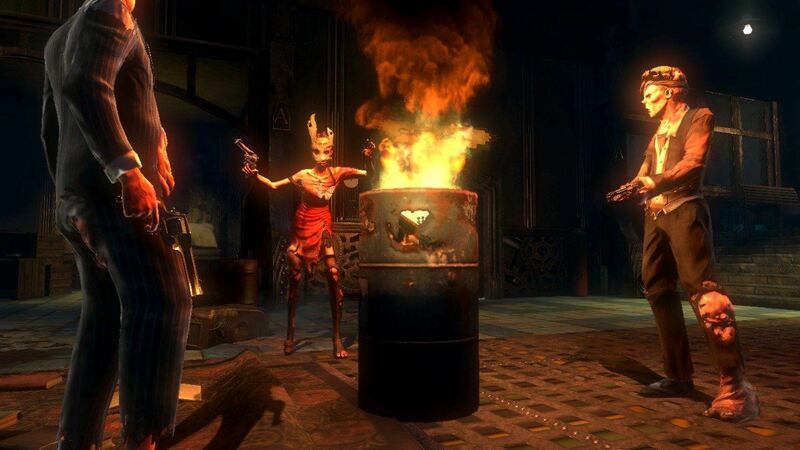 BioShock is one of the best games of all time. It combines FPS gameplay with RPG storytelling and supports multiple systems better than any other game, that much is for sure. 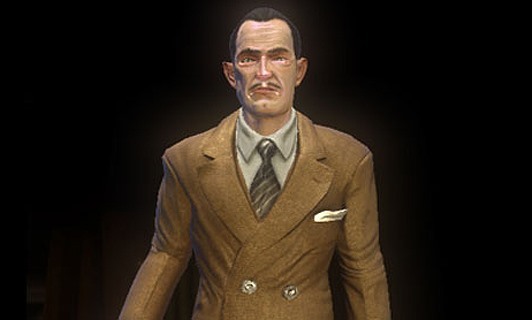 And the setting of its amazing story is a place called Rapture, a high-tech libertarian colony at the bottom of the Atlantic built by Andrew Ryan, a greying industrialist clearly inspired by John Galt and his creator Ayn Rand, the mother of Objectivism and modern American libertarianism in general. Ryan is a Soviet exile, just like Rand. 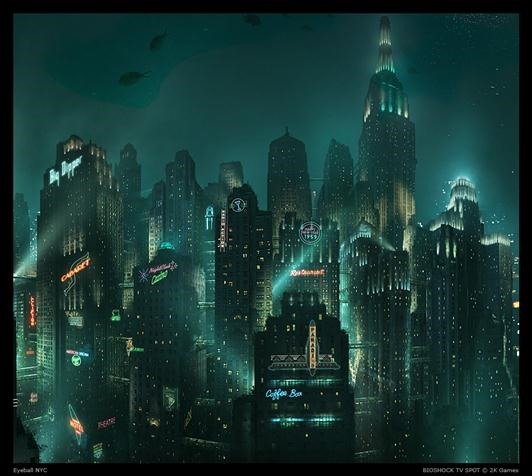 Rapture was to be the first of a new type of city-state, a libertarian utopia free from the strictures of egalitarian socialism where each man is entitled to the sweat of his brow. But it does not work. The Rapture skyline, when things were good. Within just twelve measly years, Rapture has digressed into a beautiful nightmare of cannibalism and madness. This is when the game starts. 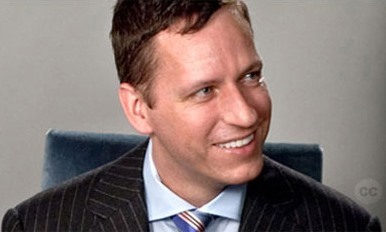 Real-life tech billionaire Peter Thiel bears some similarities to Rand, Ryan, and Galt. A consummate entrepreneur, he founded PayPal, gave Facebook its seed money, executive produced Thank You for Smoking, and has used two of his hedge funds to invest in a variety of space-age enterprises from private space travel to cheap gene sequencing. He is also a devoted libertarian, believing that social programs and enforced egalitarianism are the enemies of progress. Now, according to a long piece from this month's issue of Details, former Google engineer Patri Friedman (grandson of Milton) and his financial patron Thiel are proposing the construction of an unsettlingly similar project to Rapture. The Seasteading Institute plans to construct a series of modular, 12,000 ton, diesel-powered boats that could each hold 270 people. Patri Friedman at the Breakthrough Philanthropy event in San Francisco last year. These would be driven into international waters, away from the legal jurisdiction of any nation, and used to live out different visions of government seen as impossible to implement on the mainland. The only two described by Thiel or Friedman seem to be libertarian utopias (like Rapture) and corporate states straight out Snow Crash. No mention of a thought control utopia, a tribal communism, or any other radical state types that could use a test venue. (1) A particularly sunny vision of what a seastead could be. Watch for storms. (2) The Streets of Monaco, another ambitious proposed seastead or "flotel" as architect and Seasteading Institute stalwart Miguel Lamas calls it. (3) This one has more of a hotel/cruise ship feel, and looks a little lower to the surface than I would be comfortable with. Thiel and his Founders Fund hedge fund (which also includes Sean Parker, late of Napster and Facebook) have only given $1.25 million to the project, hardly the lion's share of their operating budget. Perhaps they can see the obvious problems with this idea. How are these nation-states going to get food? It would be hard to grow on a boat, and it's difficult to see what they would produce in sufficient volume to trade with foreign nations for all that they could not make on their own. The engineering particulars of the project are sketchy as well: the studies available on the Seasteading Institute's website mostly concern the architectural side of the project rather than considering how these colonies will actually float comfortably and safely on deep seas. To be clear, the Seasteading Institute is not trying to build these colonies itself. Its budget is described on their own websites as around $1,000,000. That's less than many people spend building big houses on land, let alone whole colonies on the ocean. Instead, their goal is to facilitate and encourage private development of seasteading projects by providing research and funding. They don't appear to have enough of either to make a difference yet. The institute is also offering The Poseidon Award to anyone who can set up a seastead meeting their criteria. No word on how much money the prize will entail, but the institute says it would like to start giving out the award in 2015. Glenn Beck with the president of the Seasteading Institute, getting super excited about the John Galt metaphor. It might be on the bottom of the sea rather than the top. Waterworld had floating colonies, too, and it was also not successful). But other than that, Rapture sounds a whole lot like what Thiel and Friedman are proposing. It didn't work out in the game, and the likelihood of it working long-term here is dubious even compared to the other failed libertarian utopias of the past, given the unique engineering problems inherent with living on the open water. The truth of people seems to be that government is inevitable when enough of us get together, as exhilarating as libertarian freedom sounds. Are you really free if you have to spend most of your time fending off your gun-toting neighbors and trying to find a doctor that will accept physical goods in exchange for surgery? man, libertarians. i think what'll happen is that the island gets sunk by somali pirates first and then they can do bioshock for real. Just couldn't leave out the Waterworld reference, could ya? Hopefully life wouldn't be that retarded on one of these seasteads. But aren't there some sorts of seasteads out there already, like floating oil rigs that house their workers? Or ships housing Navy personnel? But I guess those are all temporary, where these would be permanent, though maybe these types of people should act as consultants for life on the sea? The problem with those self contained paradise islands is the same problem that was presented in bioshock: not everyone is equal in these types of environments. To sustain those structures, you need cheap labor or hired hands to do the jobs no one wants (janitor, handyman, etc). I'm prettie sure that whatever idealist hipster lives there won't want to deal with toilet clogs or roof repair. If they contract those jobs to outside sources, then it's not really self sustainable. Plus, with only so little people per island, imagine all the inbreeding! 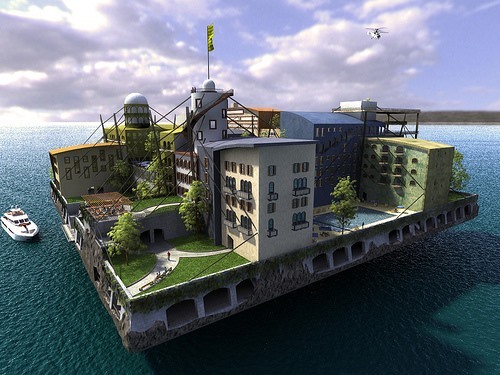 everyone is wrong about seasteading needing to be a utopia, in order to succeed it doesnt need to be perfect, it just needs to be better than what we currently have in governments. which given all the problems government is having, it shouldnt be a problem. but you gotta have something to start, and this...doesn't even have anything. "The Village" comes to mind. 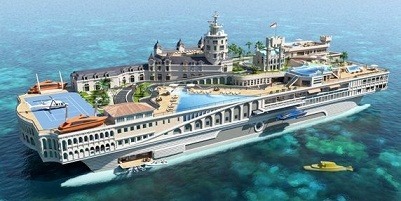 A few disgruntled citizens (one with a lot of money) designs a seastead in the middle of the ocean. On the rim of the seastead are thick trees hiding the sight of water. Kids grow up thinking there are monsters in the forest and that they can't ever leave their community, until one day someone gets stabbed. Then his fiance must go get medicine and ventures into the woods to find another society with the proper medicine. A half-twit dresses up in a monster suit and chases her through the woods. She runs and without looking in front of her, falling off the edge of the seastead and slamming into the cold ocean. She panics and drowns. Her fiance dies. And then the motherland puts the head elder in jail for endangerment. The society fails. Everybody goes back to the mainland and gets landsick. The end. It's too bad the project fell through, though from what I understand, they are looking to build similar projects, free cities as they are called, around the world but on land. Similar to what Hong Kong is to China, and that place is doing great. Personally I look forward to seeing how these experiments will pan out. Hong Kong is very, very far from a libertarian city. Public schooling (funded to about $38,000 per student), heavy regulation of drugs and a very strict law enforcement system. Try setting up a shop selling handguns and see how long it lasts in Hong Kong.